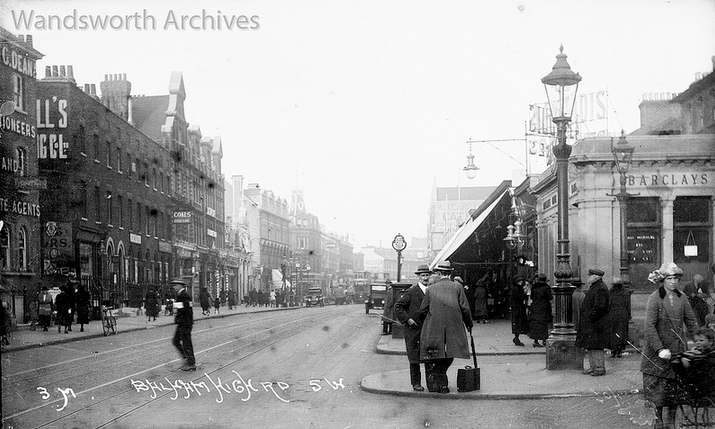 Woolworths opened on Wembley High Road in 1927. It was a small store, quite close to Wembley Central tube station. At some point the store extended into the shop on its left – see below the unit that says ‘Woolworth’ in a strange typeface. You can see the original store saying F.W. Woolworth. It was on the corner with London Road. 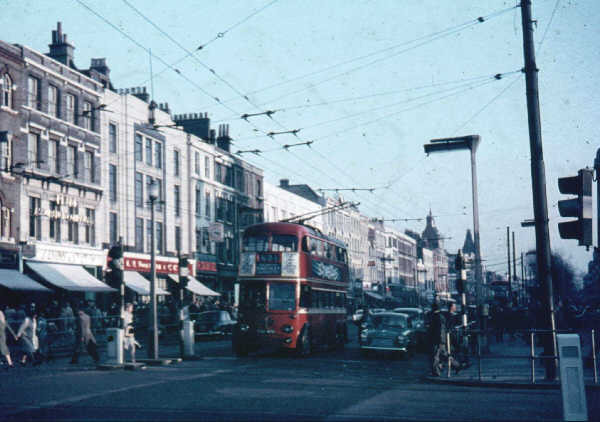 In this photo you can see Woolworths on the right side, opposite M&S. The upper floor seems to have gone, so this photo may have been taken mid-makeover. As you can see from the more recent photo, the store had a makeover with the familiar 1960s style upper floor, and the fascia/shopfront more uniform rather than looking like lots of shops put together. In the 2000s the store was converted to a ‘General Store’ which included a pharmacy and a small food range. The store number was changed to 2027. The store closed in December 2008 and became a 99p store. This then was taken over by Poundland – so now this Poundland directly faces the original Poundland that is in the old M&S building. Woolworths opened their 280th store in North Finchley in 1927. It was on the High Road, on a corner plot with Stanhope Road. They traded here until January 2009. From the style of the building we can guess there was a 1950s makeover. Today it is Poundland, where if you look closely you will recognise the Woolworths doors, tiles and black border. Woolworths opened their second Kentish Town store in 1927. The first one was on Kentish Town Road (Store 176), opposite the tube station. This second one was on Queen’s Crescent, which is on the western side of Kentish Town, where one of London’s oldest street markets is held every week (read this article to get a idea of what the market was like). You can see the store below, second from the right. The photo is from 1972 and shows an interesting ‘Woolworth’ fascia, and four entrance doors behind a central pillar, two windows to the sides. Sometime after this photo was taken in the 1970s, the store closed down. When they closed, the other Kentish Town Woolworths took the leftover stock to sell. Today it is a Nisa Local (see below). You can recognise the upper floors from the 1970s photo, just with different windows. The shop on the right is looking rather sad and abandoned – just think that corner used to say “Try Thomsons soothing syrup for baby” You almost wish they hadn’t painted over it. The lovely windows have also gone. If you are a Kentish Town local, next time you pop into Nisa Local on Queen’s Crescent, now you know it was a Woolworths. 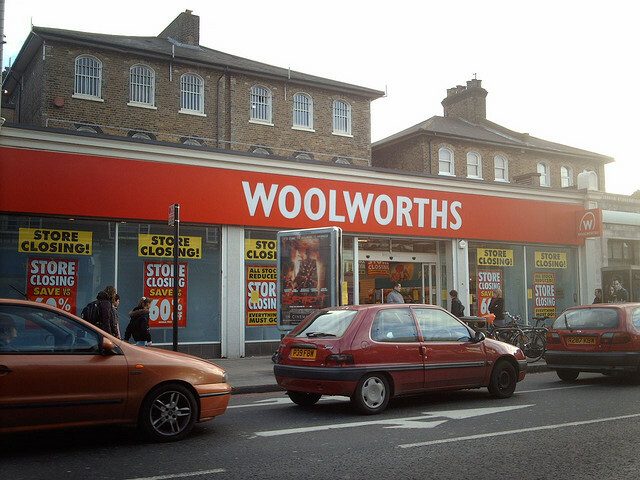 Woolworths opened in Penge, an ancient settlement in South East London from before Domesday, in 1927. At first it was a small store, you can see it in the centre on this photo. 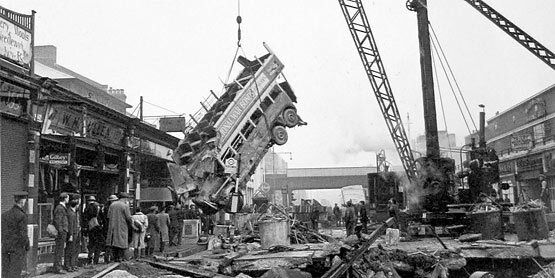 Penge was heavily bombed in the Second World War, but there’s no record of Woolworths being hit. They did enlarge the store though, extending into the building on the left side. The new bigger store had the typical Woolworths look, which you can see in this 1960s photo. I don’t have a photo of the store in the 1980s, but even better, I found a video! This is pretty amazing to watch – somebody filmed themselves walking through Penge Woolworths in 1988. You can see the doors, the tills, all the products and brands, shelves, rollcages – literally come to life as you watch it. Thank you to the person who randomly decided to film this in 1988. The store lasted until the end in December 2008, as did the retro doors. It became a 99p store, and they changed the doors – sad times. Today it is Poundland, as they took over the 99p stores across the country. Woolworths opened in Tottenham, North London, in 1927. It was on the High Road, near to Bruce Grove railway station. The store was purpose-built with an art deco facade, and next to it was Burton also with an art deco facade. It was also close to Sainsbury’s and Marks and Spencer in the early days. Tottenham Woolworths was one of the casualties of the Kingfisher takeover and was closed down in June 1986. Today it is Peacocks, and although it looks like a different building because of the brick, it is actually the original building. The tiles from the art deco facade have been taken off, but if you look at the side of the building, you can see the tiles have been left there for some reason. Here is a front angle of the former Woolworths. 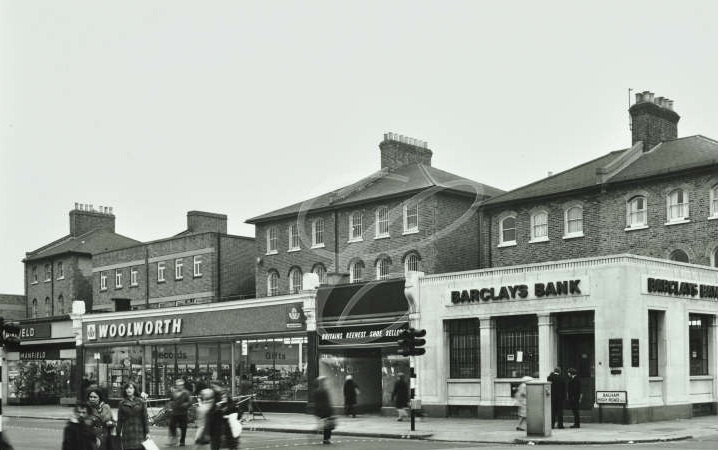 Woolworths opened their 255th store in Bermondsey, South East London. It was on Southwark Park Road, and although I can’t find an early photo, this is a photo of the shopping area of the road in the 1950s. The Woolworths store may be the store sticking out on the right. This photo is from Google Maps, taken in July 2008. The poster at the front says “£20 million summer clear out” – just 5 months before fate was to hit all Woolworths stores across the country. The store lasted until the end when the chain went bust in December 2008. Today Tesco Express is in the building. They have changed the layout of the front windows and doors completely, but the top half is as it was. Woolworths opened in West Ealing in 1926. It was originally at 77 – 83 Broadway and was huge! An early superstore from the looks of it, and very modern from the glass windows on the first floor. The window displays look lovely, as do the curtain pelmets. Some years later the store moved across the road to numbers 96 -100 in a purpose-built store with a grand Art Deco facade. As you can see, it was a large building, with the left unit let out to another shop. It was next to British Home Stores and opposite Boots. In the late 1990s, my husband worked at the Greenford store, but he was sometimes sent to other stores in the district to sort out stockrooms and cover assistant managers. He was sent to West Ealing a couple of times. He remembers the store was L-shaped and the stockroom was upstairs with a lift. It was L-shaped because the right side which was Superdrug used to be part of Woolworths. So the store opened up behind Superdrug. The stock yard was shared with them too. Mark Ward worked in West Ealing Woolworths three times – once on a refurb into a Heartland store in 1997, then as a Team leader for a year in 2000, and finally to help with its transformation to a 10/10 store around 2005. He says the store was much wider originally before half was given up to Superdrug. It had a front and rear entrance though at some point due to high theft levels the rear entrance was closed and turned into a garden centre instead! It was also the base for the area manager and area secretary for many years. My personal memory of West Ealing Woolworths is buying my toy penguin from here. It was 2005/6 and we were in the Sainsbury’s opposite buying Tim Tam chocolates. You could see Woolworths from the alleyway out of Sainsbury’s. I saw the Madagascar penguins through the window of Woolworths, as they were on a front end with the DVD. I HAD to have that penguin, so we went in and bought it. I named him Henry the Penguin and he has been in many of my photos around the UK, and even a book! West Ealing Woolworths lasted until the end, closing in December 2008. It became a Poundworld, but the future of the building is now a question mark. This side of the road is to be turned into apartments and the old BHS next door has already been demolished. There was a petition in 2018 to save the Woolworths Art Deco facade. At the moment there is scaffolding around the building to protect the facade while the building behind is demolished. Whether they save the facade or not is still to be seen. Fingers crossed they do. As for the original store at numbers 77 – 83 Broadway… it still exists! Woolworths opened on Green Lanes in Harringay, North London, in 1926. It is a historic shopping area, but unfortunately I can’t find any photos of the store. We know it closed before 1995 but after 1972. From the address, we can see it is now Iceland, and from the style of the building we can guess there was a 1950s makeover. If anyone has any information on this Woolworths store, please do get in touch. Woolworths opened its second Croydon store in 1926. The first one was just down the road at North End (Store 3). The business must have been doing really well to justify opening a branch so close to the first store. The store closed at the end of 1972, when Woolworths started to consolidate stores where there were two branches in a town centre. Poundstretcher is in the building today, and you can tell it was a Woolworths from the style of the building – the pediment and the lion head moulding that was added in, probably when the store was extended to the sides. The 220th Woolworths store opened in Fulham, London. It was on North End Road on the junction with Tournay Road. This is actually going to be a very short post because I can’t find any photos or information on the store at all. It closed before 1995 as it is not on that store list. We can guess it closed in the 1980s with the rest of the Kingfisher closures. Today Brighthouse and half of Poundland are at numbers 316 – 320 North End Road, so this is where the Woolworths store was. It wasn’t a purpose-built store, as you can see from the architecture, this is an existing parade of shops from pre-1920. Woolworths opened in Enfield Town, North London, in 1925. There are no photos of the store from the early days, but we can guess there was a 1950s makeover from the style of the building in this photo, and it looks like it was quite a large store. This store closed when the chain went bust in December 2008. It was empty for quite a few months, and then became a ‘Home Solutions’ store. Today you will find Poundland and Pep & Co in the building. Woolworths opened on Harrow Road in London W9 in 1925. 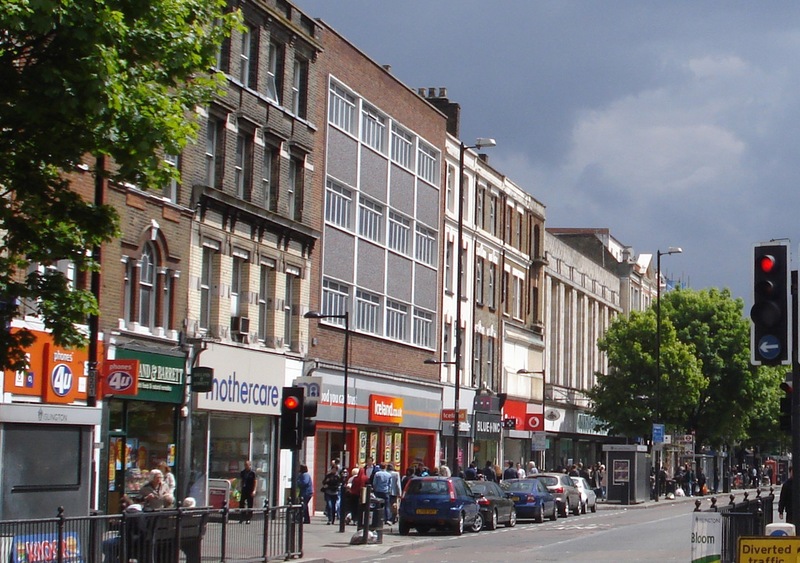 This area is known as Maida Hill, about 3 miles from Paddington. It was close to Westbourne Park underground station. 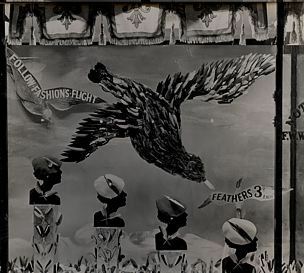 There is not much information online about the store, but there is this close-up photo from 1955. You can see the kitchenware products in the window, and how prams were kept outside in those days. It looks like this mother had an early style Smart Trike! This photo is supposedly the store in the 1960s, but I have my doubts as there are no buildings with this style of window on the Harrow Road today. 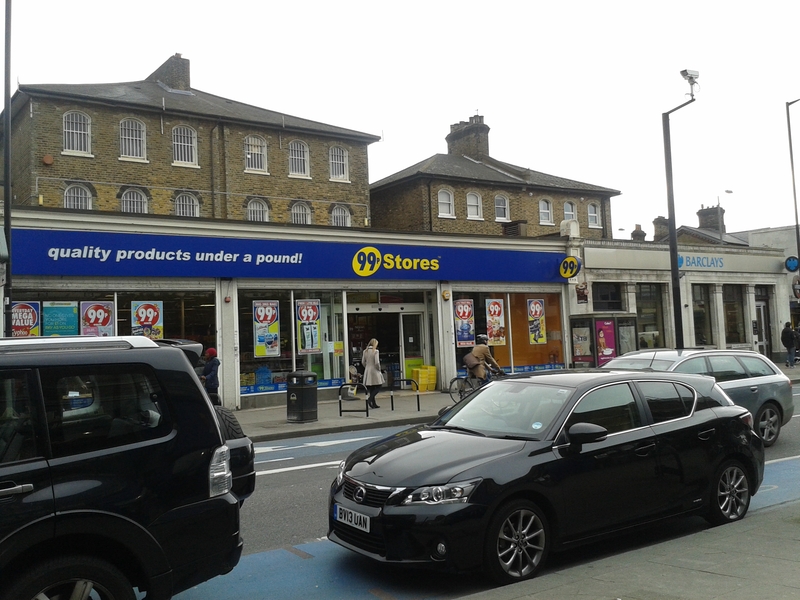 UPDATE 25/11/18: Thank to Stuart Kew for confirming this photo is of Harlesden Store 11 and not Maida Hill. I have now added this photo to the Harlesden post. The store closed in June 1986. The store at the address of 504 – 506 Harrow Road is the Co-operative (formerly Somerfield). The upper floors of this store look nothing like the 1960s photo, which is why I suspect it has been captioned incorrectly. Either that or the Woolworths store moved, and the building was demolished. All we do know is that Woolworths was where the Co-operative is today. The Upper Norwood branch in South London was more commonly known as Crystal Palace Woolworths. It opened in 1925 on Westow Hill. You can see the store in this 1955 photo, on the right with the art deco facade. I believe the store was empty for a good few years before becoming a Poundstretcher. The Woolworths tiled pillars are still in place. PS. If you look at the windows above the Little Palace Cafe in the ‘now’ photo, and compare with the 1955 photo, you can see they are the same windows in the building next to the art deco Woolworths. Woolworths opened in Shepherd’s Bush in West London in 1925. 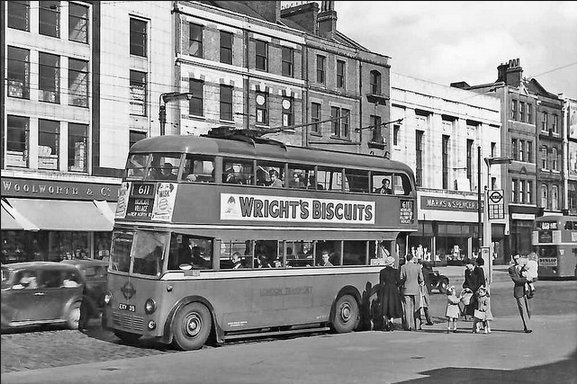 I spent a long time looking for a photo of the Woolworths, but it was very hard, as Uxbridge Road is a very long road that goes through many towns. 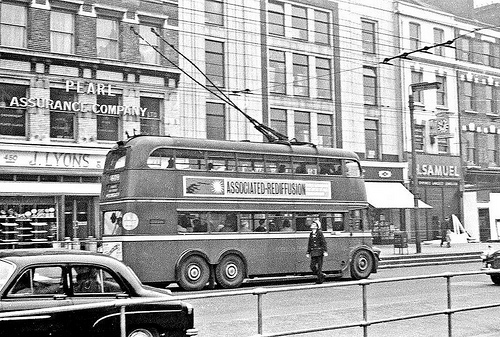 I finally found a photo but the store is obscured by a bus! You can see upper floors, where the arrow is pointing on the photo. The store closed in 1984 and has been a Superdrug ever since.